My father and I set out just before dawn. It is 18 July 1976, and I have recently celebrated my fourth birthday. Already, there are hundreds of people afoot. We are walking across the Kentish downs and the world is turning ghost-blue around us. We are carrying scaffolding, heading towards the entrance to Brands Hatch to witness the greatest drivers of their generation compete. We are early enough to choose a good spot, on a hillside just past a hairpin bend called Druids. By the time we have built our viewing platform, a warm sun is up and underlighting the few clouds in peach and rose and pale gold. This is the hottest summer on record and there is a drought, the worst since the 1720s. We turn on our camping stove and wait for my mother and baby brother. The whole of Britain is watching the British Grand Prix. They have a new hero, as do I: his name is James Hunt. Nineteen-seventy-six is the year my memory begins, the first year of my consciousness. My dad has bought me Vimto and I drink it hot while he has his tea. He is pleased with the scaffolding and our view. He is 26. We talk about who we think is going to win: I want James Hunt; Dad wants Niki Lauda. Aside from Lauda’s own Ferrari team, my father must be pretty much the only man at the circuit who does. Brands Hatch is a natural amphitheatre, the narrow track snaking between slopes from where the crowd look avidly down. Just before 3pm, the cars begin to assemble on the grid. We can see some of them coming round to take up station on the opposite hill. The tension becomes tangible; 80,000 people are now in the circuit and they’re all concentrating on exactly the same thing, communing. And now we all hear it: the deafening noise of 26 of the most highly tuned and powerful engines in the world rising, rising, rising… For three seconds, this crescendo echoes and reverberates, trapped by the landscape – and then we are racing. Clay Regazzoni, Lauda’s journeyman teammate, makes an unexpectedly good start from the second row. He dives down the inside of Lauda into the first bend – a notoriously fast and hard-to-perfect right-hander that tightens as it sweeps down the dip between our hills – but Lauda doesn’t see him draw alongside and he turns in. The Ferraris touch. Regazzoni starts to spin. Hunt goes wide on to the grass to avoid the accident. But Regazzoni’s trajectory carries him hard into the side of Hunt’s car. So now Hunt’s McLaren rears up sideways in the air and slams down again, breaking his front suspension. Meanwhile, cars are screaming down behind them at ferociou s speeds. There’s water on the track from Regazzoni’s radiator. There’s no grip and nowhere to go. Several drivers career into each other as they swerve to avoid what is unfolding ahead. Dust rises, debris flies. Cars and bodywork are strewn over the circuit. It is impossible to see. We are standing up on the scaffolding, mad with excitement. The race is stopped. We watch Hunt nurse his broken McLaren round in front of us. We can hear it scraping on the tarmac. He pulls off, up a slip road, and so shortcuts back to the pits. The atmosphere turns febrile. The crowd begin to throw cans and even bottles on to the track. My dad continually has to ask other spectators to stop climbing on the scaffolding for a better view, because he is afraid they will topple his young family headlong to the ground. The marshals are trying to sweep the broken glass off the circuit, even while they are being hit. Menace hangs in the air; the event organisers fear a track invasion and worse. I am subdued and anxious, suddenly a small child in an adult world. A stopgap decision is made: in short, to ignore the rules and sort it all out later. They will restart, with Hunt readmitted. The victorious roar from the crowd is louder than the engines. Away they go again, but this time, as they come past, Lauda is in the lead with Hunt second. Watching these men drive close up is like watching the gods compete. There is the visceral thrill of their implausible speed; they are at the absolute limits of adhesion. But more than this, they are at the limits of their own humanity; even as a child, I have a sense of their extraordinary physical skill and their intense concentration, the split-second adjustments they make as they weave and dart to pass each other on the narrow ribbon of tarmac. I can see them wrestling with their steering wheels: correcting slides, jerking right and left, trying to pass, to defend, to stay in the race. Most of all, though, there’s the danger. I learned about death watching motor racing. In those days, the cars were flimsy, with no thought for safety, only performance. If a driver crashed unluckily, he would die. These men were supposed to be fearless: that was the point. Five drivers had been killed since I had been born, and I knew this. When I went to school, I scorned the boys who venerated rugby and football players: these men were not in the same league, they seemed to me pedestrian. We watch Lauda come through in his scarlet Ferrari, smooth and exact and certain; he is elegant. Hunt is giving chase, sliding and fishtailing and sweeping his McLaren through the bends that Lauda has so precisely piloted moments before. They’re on the ragged edge, but neither is able to best the other, until, on lap 45, Hunt draws alongside going into Druids. When they emerge in front of us, Hunt is just ahead. We are in the right place at the right time in the world. Earlier that day, Dad and I had gone for a walk opposite the pits, amidst the frenzied activity of the mechanics, the erupting engine noise, the deferential film stars and the muted politicians. Hunt was answering questions from the public. Somehow Dad managed to get the roving microphone, pass it to me and whisper what to say. Suddenly I was speaking to James Hunt over the public-address system. My father inclined his head, in the way he does when he wants to encourage me. So I said that today still counted as my birthday, even though the actual date was a few days before, because coming to the Grand Prix was my big present, and Hunt laughed and told me to “keep the party going”. He asked what I wanted to be when I grew up. I told him I wanted to be a racing driver. He took me seriously and said that the best plan was to assume anything was possible, and to ignore anyone who told me different. I could not have articulated it then, of course, but Hunt seemed to me everything a boy might hope to grow up to be: brave, engaging, intelligent, irrepressible, cool. He smoked Rothmans, even though his main sponsor was Marlboro. He liked to turn up to corporate events barefoot. He had the magic with girls, and he didn’t care what people thought or said. He was his own man. Most of all, he drove with flair and adrenaline. His team manager, Alastair Caldwell, once said that “when the car was switched off on the grid, [Hunt] was so wound up, the whole thing was shaking”. Later, back on the scaffolding, Dad read me an interview with Lauda. The Austrian’s nickname was “Super-rat” because of his slight overbite. He was shy, slight: only 5ft 8in. He was married, monogamous, meticulous. He didn’t smoke, he didn’t party. He stayed late at the garage, working with his mechanics to perfect every aspect of his car. Here, then, were two great sportsmen, so different in character that they might almost be from different species: Hunt the epicurean, Lauda the ascetic. And yet they were both winners. Their rivalry, like all great rivalries, was based on the emotionally powerful conjunction of this difference and this similarity. I can see in my own life an effort to reconcile their two versions of masculinity: on the one hand, to live without fear, in the moment; on the other, to devote myself to the painstaking, near-monastic business of attempting to write half-decent novels. A few years after that day at Brands Hatch, my father and I are in the forests of the Eifel Mountains. We are driving around the infamous Nürburgring in Germany. This is a circuit unlike any other: more than 14 miles long, with endless gradient changes and more than 170 corners. We’re going slowly, looking for something. There is mist hanging beneath the trees and the valleys are lost below. Misshapen stumps and improbable rocks fringe the track. Black birds dispute the white lines. In the 1970s, safety here was next to non-existent – ambulance stations were miles apart – yet the average lap speed was 120mph. 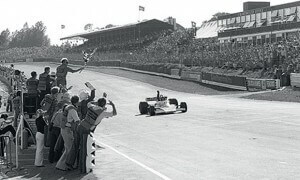 Exactly two weeks after that 1976 British Grand Prix came the German. As Lauda made his way into Nürburgring that morning, a member of the public had thrust a photograph of Jochen Rindt’s grave into his face, hoping for a reaction. (Rindt was the last great driver to represent Austria; he died in an accident in 1970.) Lauda was so anxious about the dangers that he convened a poll among the drivers as to whether they should race at all. He lost by one vote. Worse was to come: before the race, it began to rain – but only on part of the circuit, which meant that there was no good tyre to be using. Lauda started on wets and then changed to dries and went out again. He was trying to make up positions. As he came through a lefthand kink, just before a corner called Bergwerk (“the Mine”), his rear suspension collapsed. This is the place that Dad and I have been looking for. The corner feels threatening, like something from Grimm’s Fairy Tales, a forgotten section of the circuit hidden among the dense trees. Lauda is doing 130mph as he enters that kink. As the car fails, it slews right, digs deep into the feeble catch fencing, hits a bank of earth behind and is sent airborne back into the centre of the circuit. The fuel tank fractures. Petrol spews. Everything is on fire. Around the corner comes British driver Guy Edwards. Somehow, he misses the wreckage. The next two drivers do not: they spear into the stricken Ferrari at sickening speed, sending it slithering and shattered farther down the track. Lauda is trapped in the car. The fire rages at 400C. His helmet is half off and he is burning to death. Several drivers stop and run towards the blaze. They are desperately fighting to get Lauda out, but they cannot reach far enough into the intense heat. They can’t loosen his belts. One of them gets an extinguisher. They make one last effort and somehow haul him out of the cockpit. Lauda is still conscious, lying on the track, asking about his face. He has been burning for nearly a minute. My Dad and I drive all the way around Bergwerk in silence. At the hospital, Lauda is read the last rites and everybody, including his doctors and his wife and his mother, who is interviewed on German TV, thinks he is going to die. He has first- to third-degree burns, a broken collarbone, cheekbones and several ribs. But what is killing him is that his blood is poisoned and his lungs have been scorched and are filling up with fluid. Then the miracle happens. Forty days later, Lauda returns for the Italian Grand Prix in Monza (where Rindt died) to fight on. He is alive through sheer force of will. He has half an ear missing and hair on only one side of his head. His wife spends most of the weekend resewing his balaclava to protect what is left of his skin. Nobody can believe he is standing, let alone at the circuit. But here he is, climbing into his Ferrari, out-qualifying his teammates, out-qualifying Hunt. He finishes fourth. When he takes off his helmet, he is covered in blood and pus. Back in England, my four-year-old self has fallen in love with Niki Lauda. I like to think about those words from time to time, and what they mean. As my father taught me, masculinity is subtler than the world sometimes like to spin.